There are no rules for a wedding lounge. 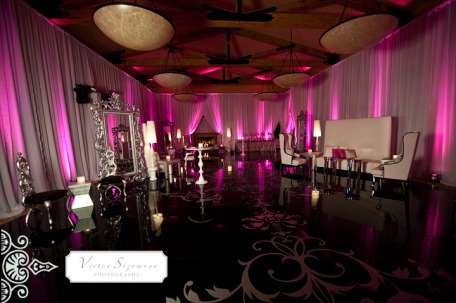 You may choose to have lounge decor for your cocktail hour and then move on to a more traditional-style reception for dinner and dancing. Another option would be to forgo the "traditional" seated dinner and serve tapas-style small plates at stations throughout your lounge to give your guests more of a "club experience" at your reception. A third possiblity would be to have a "traditional" seated meal with all of the toasts and traditions and then move your guests into your "lounge" for an amazing "afterparty" where dessert is served on the dancefloor. There aren't any rules for a Mitzvah lounge either. You can create a lounge for both the adults and kids to enjoy during the cocktail hour or you can create a "kids only" lounge during the cocktail hour which features special activities to keep the kids entertained. The most popular way to incorporate a lounge into Mitzvah design is to have traditional adult seating on one side of your reception space and on the other side of the reception space replace the "kids tables" with a "kids lounge". (If you choose this option you will need to serve the kids meal buffet style instead of plated.) The tween set really seem to enjoy "lounging". If you are thinking about a lounge for your Wedding or Mitzvah, keep in mind that there is no right or wrong way to create a lounge. Be creative and have fun.